Companies looking to get more out of their communications and CRM packages can now take advantage of a free integration and consultation service on offer during April 2015. VoIPstudio, the specialist in high quality business VoIP communications, is offering free integration with SalesForce – a solution which delivers significant improvements to productivity and the quality of customer service. By allowing a business to make and receive calls from within the Salesforce.com CRM platform, VoIPstudio integration makes interaction with customers seamless and simple, enhancing the productivity of sales and CRM teams. 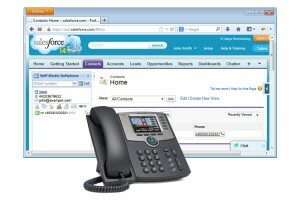 Having company extension numbers integrated with Salesforce.com makes it easy to route calls directly to the right team members, who can then answer the call with all the information they need on the screen in front of them. It also significantly improves incoming caller identification. VoIPstudio released its SalesForce integration on June, 2014. Mr Ozarek says the solution VoIPstudio has created sets new standards in cross-platform integration, being both easier to use and to implement. Free consultancy is also on offer throughout April for any businesses that need to know more about the advantages and practicalities of integrating CRM and communications tools.